All vehicles, including cars, vans, trucks, trailers, and motorhomes, must have a valid license plate in Colorado. You can register your vehicle at the DMV and require validation tags in addition to your vehicle’s registration. You must go to the Department of Motor Vehicles in Colorado to register your vehicle within 60 days of its purchase. If you are a new resident of Colorado, you should visit the DMV to register your out-of-state vehicle with 90 days of your arrival. In addition to applying for a license plate, you are also required to purchase validation tags. You’re required to obtain registration tabs to validate your registered vehicle. If you are driving a car, van, or truck, you will be required to have plates on both the front and back of your vehicle. These tags are valid for 12 months and required to be renewed each year. Since your tags are only valid for 12 months, you are expected to renew them before they expire. Failure to do so would put you in the position of driving illegally which has financial consequences. You can renew your vehicle’s tags by applying online, sending an application in the mail, or visiting the DMV in person. Renewal fees will vary, depending on your vehicle and type of license plate. If you are purchasing a new vehicle or waiting for your plates to be sent, you must obtain a temporary permit or license plate which allows you to drive your vehicle. You should visit the DMV prior to purchasing a vehicle unless you are doing to a dealership. Most dealerships will provide you with a temporary permit to drive your car home and to the DMV. Temporary license plates and permits are usually valid for up to 60 days. Each country has different requirements for the registration of your vehicle. Please contact the nearest DMV to get more information. Note: Counties of Boulder, Broomfield, Denver, Douglas, Jefferson, Adams, Arapahoe, Larimer and Weld require passing emissions results before you can register a vehicle. Sales Tax - You will be charged based on the amount of money you spent on your vehicle. License fee - You will be charged based on the weight, date of purchase, and taxable value of your vehicle. Ownership Tax- You will be charged a percentage based on what your vehicle was worth brand new (i.e. personal property tax). When you register your vehicle, you may be able to pay for any applicable fees using cash, MasterCard, Discover Card, VISA. 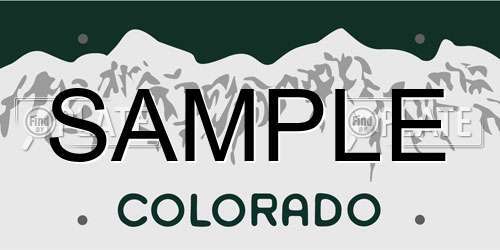 There are more specialty plates to choose from in Colorado. You must apply for the plate you want and be eligible for certain ones, such as any war veterans plates. You must also pay any additional fees that are included with these specialty plates. If you fail to explain the meaning for your license plate, your application for a personalized plate may be declined. The cost for these plates is an additional $50 on top of your standard registration fees. Renewing these plates cost only $25 and your regular renewal rates. You should always report your missing plates to the police to prevent misuse and abuse. It is possible to search for license plates in Colorado for free. Go to FindByPlate to start a search and obtain information about a license plate available, past history, and more.